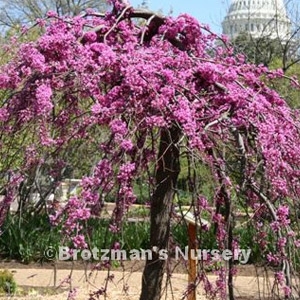 Lavender Twist® Redbud is a uniquely weeping specimen that will add ZIP anywhere in your garden or landscape. Spring blossoms with lovely lavender flowers gracefully adorn the branches before foliage emerges, summer brings a beautiful umbrella of heart shaped leaves, and fall ends the growing season with golden yellow foliage. Deciduous.